Janet and I are in Atlanta Georgia for the 2009 Eucharistic Conference. Tomorrow morning we will join over 30,000 Catholics processing with the Eucharist held high following Archbishop Wilton Gregory! After the procession I will be giving a talk in the HUGE auditorium. My talk will be "Defending the Eucharist." Would you like to join us? Well you can — kind of. I will be taking videos of the event and upload them on my blog tomorrow or Sunday. Stay tuned! To learn more about this event, visit http://www.archatl.com . 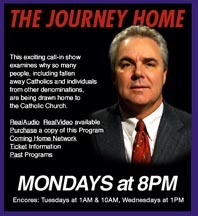 I have been on EWTN's The Journey Home with Marcus Grodi five times. Once for my conversion story, one Open Line Friday, two Open Line Mondays and one for a Baptist Roundtable Discussion. If you want to listen to them, along with other TV and radio shows, click here. Scroll down to Miscellaneous Audio.